Are we seeing a theme today folks? Yes, yes we are I live in Tornado Alley so needless to say good weather information is one of my biggest priorities this time of year. 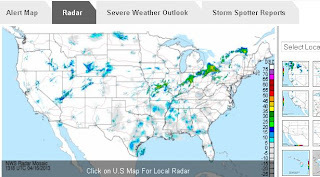 Free online radar map that shows real time US weather radar. This is a very easy straight foreword weather map. Loads quickly & works great other sites seem to have a lag time or freeze up. This site seems to work well and has several helpful other options as well. Check out their Alert Map, Radar, Severe Weather Outlook & Storm Spotter Reports. Click the link below to go to the map now.